Why should we use Gaming themes? From browser gaming and game-engine support, the ability to show a large amount of visual content at once and good optimization, gaming websites need it all. This technical field also revolves around social media and community management as well and some themes can help you create different types of profile systems as well. Additionally, managing your Gaming websites you might come to face various issues. These can range from lack of customization options, video and media integration to banner/ad issues. So, to help you monitor and fix these issues, we’ve selected some amazing WordPress Gaming themes we can personally recommend. They are highly accommodating to a wide range of purposes for your websites. For your convenience, we’ve highlighted all their core features, areas of usages and essential factors for these awesome gaming themes. Furthermore, the list also contains excellent free WordPress gaming themes so you can start your gaming website with minimal costs. So without further ado, let’s take a look at our list of both premium WordPress Gaming Themes and free Gaming WordPress themes. Play is a free theme created with tons of amazing features to help you create a large number of versatile content. From YouTube/Vimeo Integration to Social media integration and even WooCommerce support, the theme provides a large number of tools for you to work with. From making blogs, video and text guides, selling your gaming products online to sharing your games with detailed documentation, this highly responsive WordPress theme provides you with it all. Moreover, the theme is quite easy to set up as well and provides you with various documentations if needs are. 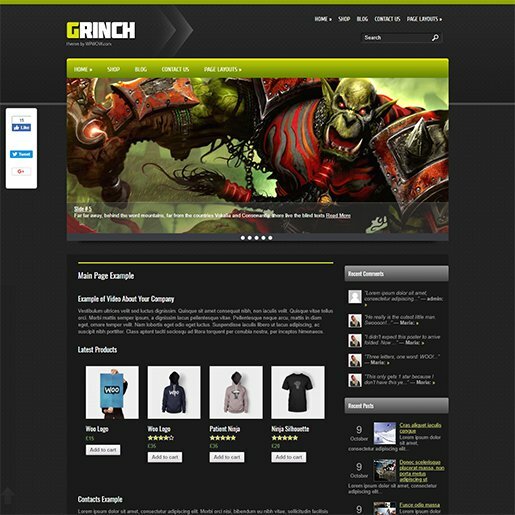 This SEO optimized theme is perfect to start your journey in the gaming industry. Fully responsive design built to work perfectively on all platforms. Custom drop-down menus and customizable logo options. In-built Google Custom form and Google Maps integration. WooCommerce support to help you produce various gaming hardware and software and share it efficiently. 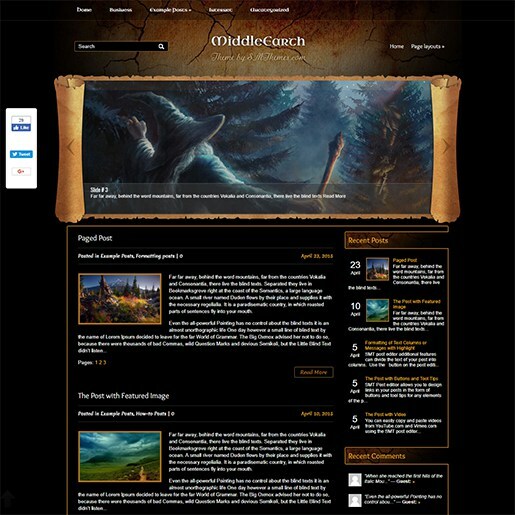 Middle earth is a Lord Of the Rings influenced WordPress theme that has a breathtaking fantasy themed design. The medieval fantasy designed WordPress theme packs quite a huge range of feature to help you implement a wide range of services on your gaming website. The SMT framework 2.0 powered theme lets you easily customize sidebars, social share bars, UI settings and Menus. Middle Earth lets you place elements such as Google maps shortcodes, sliders and more all over your website. The theme oozes an aura of otherworld fantasy and vivid imagination which makes it perfect for various purposes such as Community forums, help guides, news and blog content and the existence of multicolour related posts. Supports Dynamic Content loader, AntiSpam without Captcha and Google Maps. 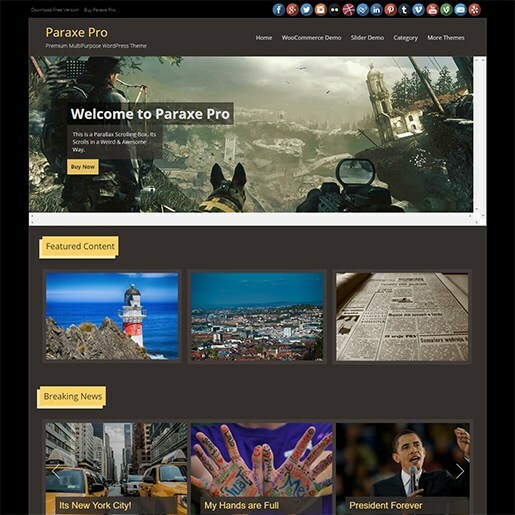 Paraxe is a free WordPress Gaming theme that sports a modern and sleek design, customized web elements, amazing drop down menu customizations and WooCommerce support. Impress your viewers with a highly functional slider that can be enabled on every webpage. The WordPress theme also allows you to place a social bar on your header with a wide range of supported websites. 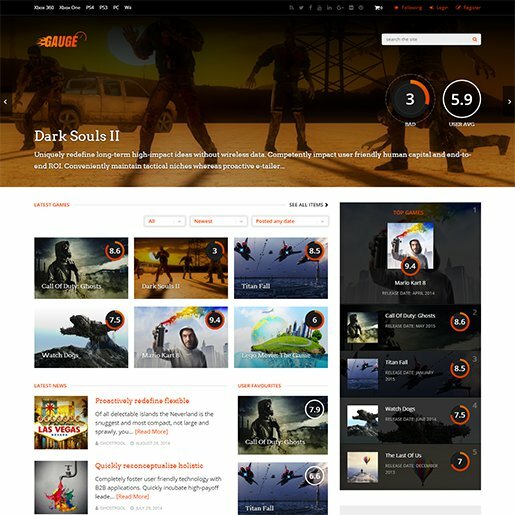 Paraxe is perfect for both gaming blogs and magazine/news related content and even enables you to sell your products online with its WooCommerce integration. The gaming theme is completely translation ready with its WPML support which can help you tap into a large number of the non-English speaking crowd which is quite prevalent in the gaming industry. Following up is another impressive free WordPress theme that oozes an aura of professionality like no other. This SMT framework powered theme features an amazing design filled with parallax effects, multicoloured related posts and translation features. The theme also contains advanced editor options to help you create informative blogs and breathtaking reviews with various all forms of typography-related elements. Using Gamelab, you can also easily sell your games and gaming related items. Slider ready design, Custom menus, Antispam features and completely SEO optimized. 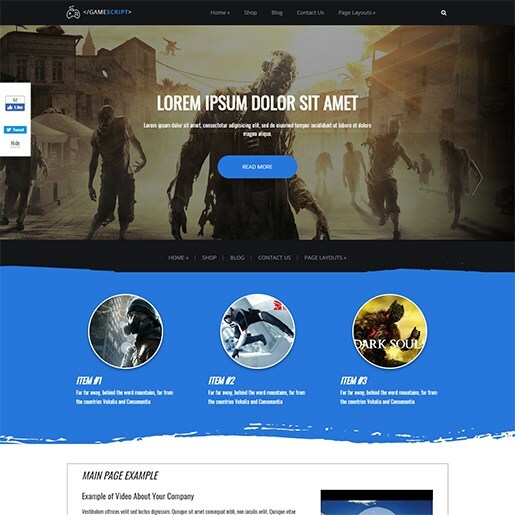 This amazing theme is an entire package of impressive designs and website management tools to help you create a frontend that is sure to wow any gamer out there. With its all-powerful theme options panel and integration with WP Bakery page builder, you can create breathtaking gaming forums, clan sites, news channels and game stores with minimal effort. 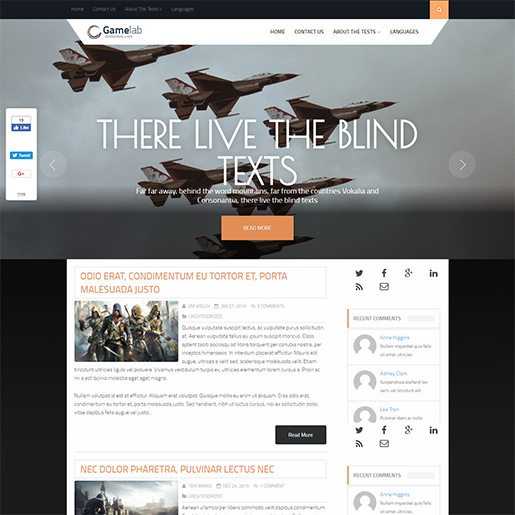 The retina ready design, parallax blocks, flexible frontend composition, unlimited layouts and colour options and Google fonts integration YouPlay present you with are also great tools to help you create a fantastic website experience for gamers. Furthermore, if you want to save time and effort, you can efficiently use its demo imports to build a pre-designed website instantly. Highly customizable options with WP Bakery page builder integration. One click demo import with four different demos available. Social sharing and accounts buttons with shortcodes/widgets. In-built support for Contact form7, Revolution slider and more. 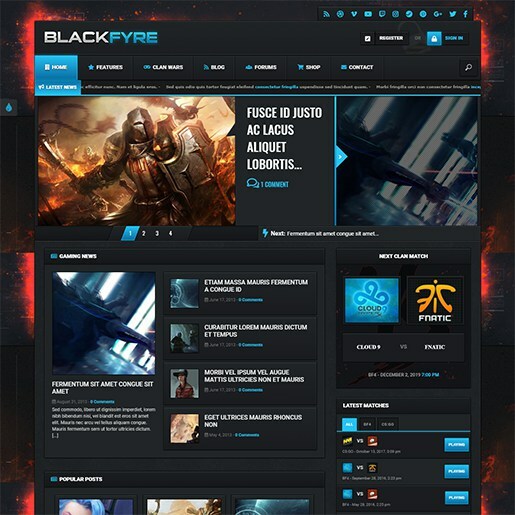 Created for making social networking sites for gaming communities, Blackfyre provides a wide range of features to help you create exclusive clan sites, gaming groups, content sharing websites, discussion channels and more. Alongside a highly efficient user account creation and management system, Blackfyre also supports Clan creation to help your users to make various plans for their games. Not only that but using the Clan war system you can manage team matches between clans as well. With its extensive set of theme options, Visual composer powered page builder and fully responsive design you can quickly create an amazing gaming design. Account creation and administration system with bbPress and BuddyPress support. Clan creation and management system as well as Clan war system. Visual composer integration, Parallax blocks, CSS3 styling and animation. Predefined page layouts for Clan designs. 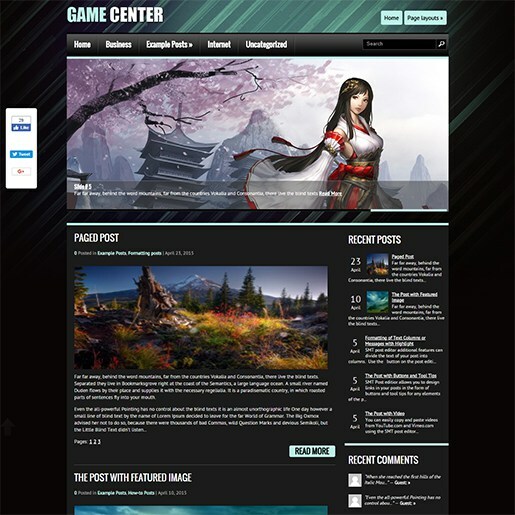 GameCenter is a free WordPress Gaming theme with gaming websites in mind. The theme by default sports a black and blue design that gives a striking ambience that gamers enjoy. The theme comes with various page layouts, post formats, custom sidebars and a fully functional social bar. You can create a website to sell your games, applications, gaming plugins and add-ons with its Ecwid and WooCommerce support as well as for blog and magazine websites, Its slider and translation ready, SEO optimized design is also a welcome addition to its wide range of free features. 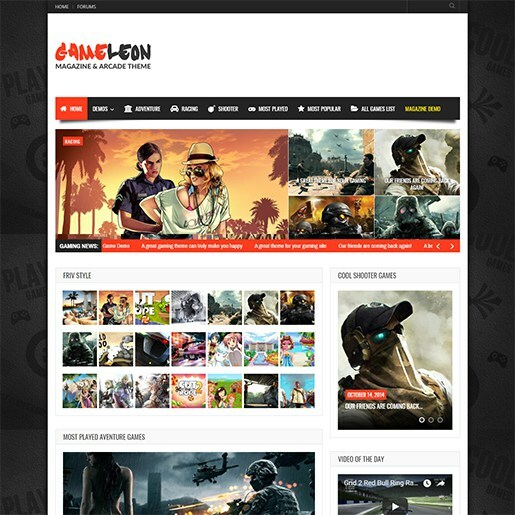 Rather than a Social website, Gameleon is a gaming website designed for online games, arcade games, editorial and news sites for games and gaming events. From doing reviews, covering gaming conventions to sharing amazing online games, you can do it all using Gameleon. The theme features Unity 3d ready design, HTML5 games’ full-screen compatibility for mobile devices as well as MyArcadePlugin compatibility to allow you to create an amazing arcade experience for your viewers. Gameleon features a myriad of add-ons and options to ensure that you can share an exquisite gaming experience with your visitors. Unity 3d, HTML5 API, Flash and MyArcadePlugin compatibility. Gameplay trailer tabs, Game screenshots tab. Review systems and Sticky sidebars. Adsense Ready design with Interstitial ads with progress bars. A wide range of theme options, Custom post meta boxes and Fully widgetized homepage. Built from the ground up using HTML 4 Bootstrap, Gameforest provides a highly customizable gaming website that is designed to be responsive, fast and efficient. With over 70+ HTML files and customized files and elements such as progress bars, buttons, widgets and more, you can use Gameforest for a wide range of purposes such as gaming, streaming, blogging/vlogging and more. Easily customize your website’s outlook using its mega menu, versatile theme panel, frontend build tools and more. 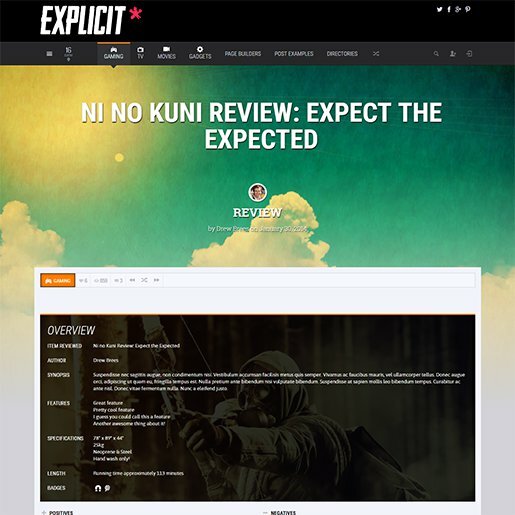 The theme also contains useful elements such as listing pages for games, dedicated gaming widgets, login/register pages, game reviews sections and more. Completely built on HTML, powered by Html4 bootstrap. Inbuilt gaming widgets, galleries for photos, custom bootstrap components and more. Notification plugins, slider and effects integration and lightbox plugins. 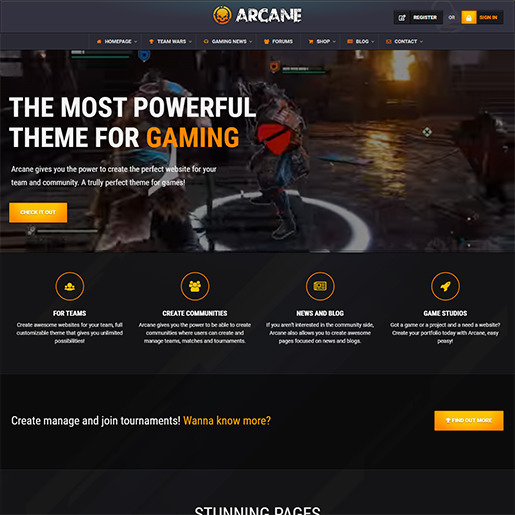 Tuned and designed for gaming websites, Arcane provides an exquisite gaming experience unmatched by many themes out there. This dedicated gaming WordPress theme provides you with the right tools to create gaming communities of massive proportions. From forms teams to managing tournaments, content sharing, custom user and team profiles, you can do it all with this plugin. Arcane features parallax blocks, video blocks, CSS3 styling and animations, a wide range of typography options, and visual composer integration. You can use these to easily create a user experience that would suit a gaming crowd perfectly. Dedicated Tournament and Team match systems. In-built User team and profile management tools. Full BuddyPress and bbPress support. A wide range of typography options, animated images and icons, Rating systems and other gaming widgets. GameScript fulfils the purpose of a functional theme for a wide range of uses. 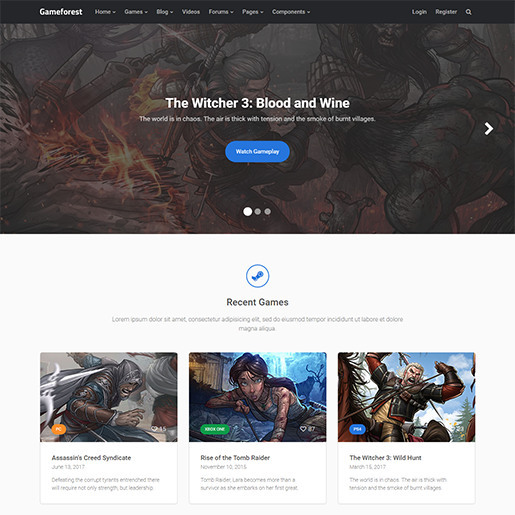 You can use this amazing theme for your gaming blogs, news channels, editorials, commercial markets for games, product reviews and more. Gamescript features a highly functional slider for previewing your content. The wide range of customized elements also helps to give your gaming website that sleek and unique design. In addition, Gamescript also sports YouTube and Vimeo integration, Google maps and Woo Commerce support. Gamescripts comes with a custom contact form for customer interactions, threaded comments, customizable logo and custom drop down menus as well. Consequentially, The sleek and clear layouts are sure to impress your website viewers dedicated to gaming. Highly responsive featured slider and custom drop down menus. WooCommerce integration for product sales and more. Threaded comments, Social share bar and Custom contact form. 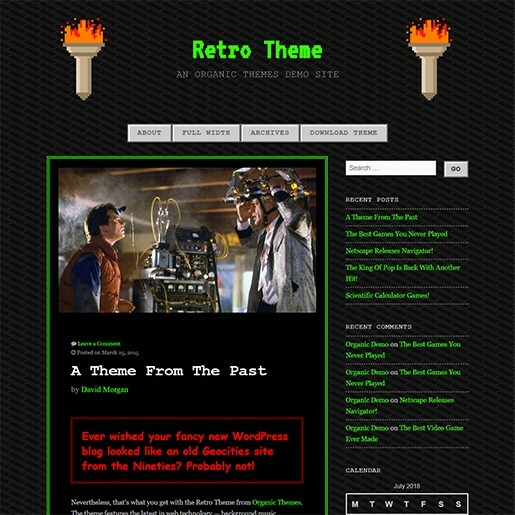 Created as a joke, Retro is a free WordPress gaming theme that emulates that 90s Geocities feel to give your viewers a sense of nostalgia. Flash animation lookalikes, the rigidly structured layout, pixelized art and neon colour design, buttons and interface full of sprite art: Retro provides you with all. Remember those annoying 8-bit tones the old sites used to have? If your website is aimed towards the retro gaming community or if you feel like implementing a nostalgia-inducing website design, this theme is perfect for you. You can also use this amazing theme to build a retro-themed arcade, a blog site for reviewing older games or newer indie games and appeal to the nostalgia factor of the 80s to the late 90s gaming industry. Sprite animations, Neon colours and Comic Sans MS fonts. Content pagination, Featured images, Multiple column layouts, features and other blog-centric features. Lets you enable or disable a midi music through the Live Customizer. To me, Grinch gives that good old school Warcraft/Fantasy RPG vibe. The developers of this free Gaming theme created it with storytelling and imagination in mind. Create detailed and vivid storylines using this highly accommodating theme. Using EcWid and WooCommerce, you can easily sell your products as well. Grinch is also perfect for creating and sharing online comics, webtoons and similar graphical media. The UI for this theme is endearing, no thanks to its custom menus and sleek design. With its SEO optimization and translation options, you can ensure that your content will be spreading at light’s speed. All you need to do is work-work! Custom widgets-ready and Shortcodes ready features with inbuilt Google maps shortcode. 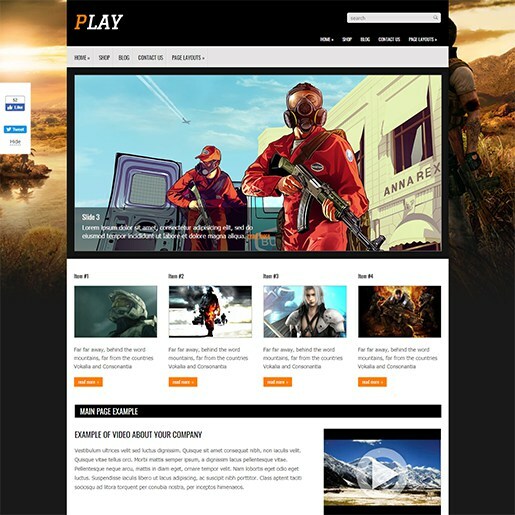 Oriented to build impressive gaming websites, this premium WordPress gaming theme is filled with features that are quite welcomed. Explicit was built with mobile users and thus provides you with a wide range of touch features including touch/slide based master sliders and mobile menus. 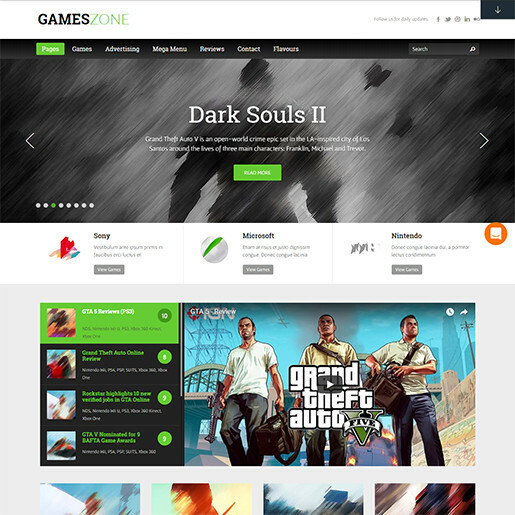 The theme is perfect for gaming editorials and reports as well as blogs as it has an inbuilt infinite loading feature. Moreover, with its integration with Ajax, you can easily create a well paged and sorted blog instantly. The theme also provides creative site section creation tools, custom widgets, lightbox galleries, social sharing and more. Mobile ready design with interactive touch sliders and menus. 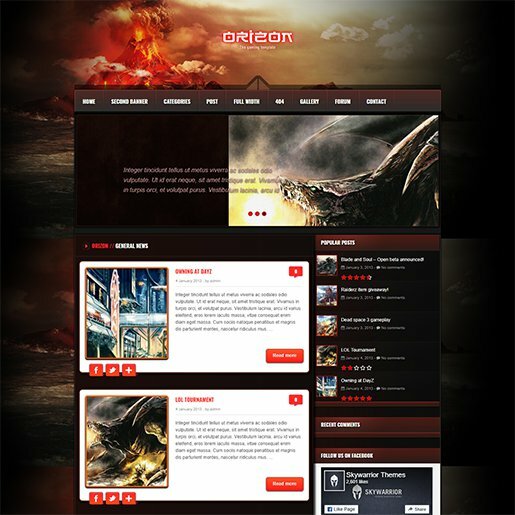 One of the most popular gaming themes out there, Orizon is an awesome CSS3 designed theme built to create stunning gaming related sites. It sports with a highly responsive with two distinct colour design and a wide range of customization options. The theme also comes with two slider options: Parallax and Tab selector. Orizon is also ready for community interaction and discussion with its BuddyPress compatibility and highly functional rating system for your posts and games. Additionally, if you ever find yourself unclear about modifying this premium theme you can always refer to a large number of video tutorials made for this purpose. Theme barracks powered theme options with 2 distinct colour designs and 5 different background combinations. Integration with Isotope gallery and Layerslide premium slider. Rating system plugin for users to leave product ratings. Detailed video tutorials and documentation. Created for making a highly responsive review system, Gauge is a website theme perfect for creating content sharing and social interaction websites. But this plugin adds up to that by providing your website users with the tools to leave their own reviews on other’s content. This review system comes together coupled with an amazing rating system. In order to help your viewers with their selective content, the theme also comes with Ajax filtering as well. Gauge is not lacking in terms of customization features as it also comes with a large set of customization options as well as integration with Visual Composer. To top it all off, Gauge is highly UI and UX oriented as well and provides you with a powerful menu with wide range of customizations. Review posting, rating and Hub designation features. Front end posting for users, Portfolio tools and Social media login. Profile linking, user following and various other user-to-user interaction features. Visual composer integration with individual and global options. The competitive gaming industry has been on the high rise for quite some time. With all the insane amount of investments involved, we were bound to have a WordPress gaming theme made for accommodating eSports gaming organizations. And, PixieHuge serves this exact purpose. 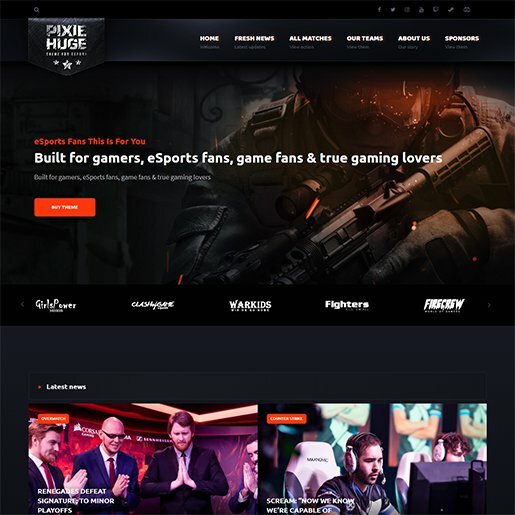 Whether you want to build a small-scale team site and spread information about your players or manage large-scale organizations like Team liquid or Virtus Pro with various gaming divisions, PixieHuge is perfect for you. PixieHuge provides you with sections with designated purposes such as player profiles,, sponsor promotions, various game departments, match history and achievements list. 5+ importable designs to instantly build your eSports website. Specified sections that can be arranged by simply dragging and dropping. Pages made for specific purposes such as Team achievements, Sponsor promotion, Live streams and more. Fully colour customizable with a wide range of theme options. 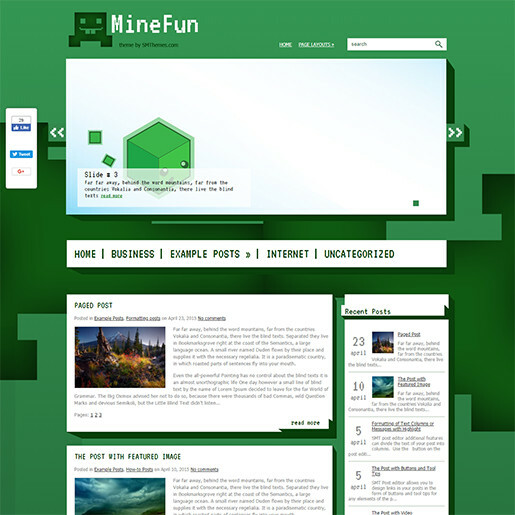 MineFun is a free gaming WordPress theme inspired by Microsoft’s classic sandbox game, Minecraft. The theme’s visual aesthetic was loosely based on Minecraft. The large rigid pixel blocks, the low bit pixel text design and the bright colour design, it has it all. The appealing green huge background also highly adds to the visual element of your website. As for technical features, the website contains a large number of features for making amazing gaming blogs. With various blog formats, social share bar, shortcodes read and multicoloured related posts you can ensure your blogs with be loved by a man. EcWid and WooCommerce support for selling products. Custom widgets ready, shortcodes ready and highly functional Custom menu. 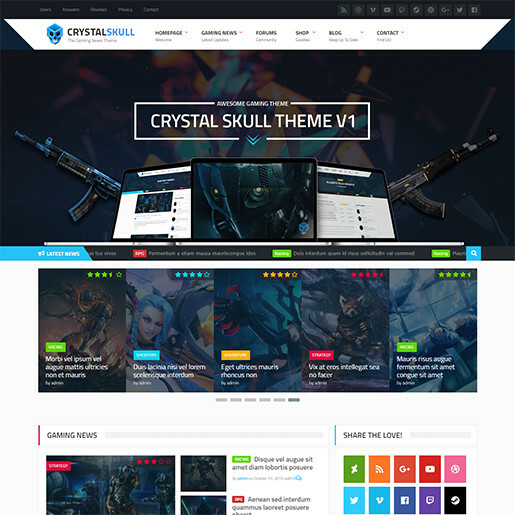 If you want to create an E-commerce gaming website, Crystal Skull is a great option for you. 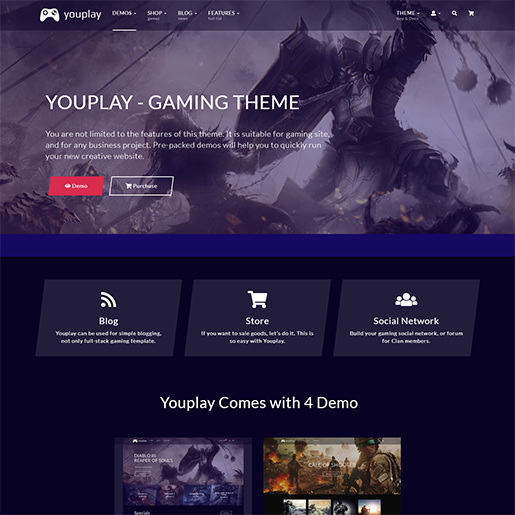 This Visual composer powered WordPress gaming theme lets you amazing websites with high definition elements with its parallax and video blocks. Put that extra charm on your website with all the animated icons and images the theme provides you with. The website lets you easily set up shop with its WooCommerce support complete with review systems for users. You can use its amazing slider options to preview products to your viewers as well. Moreover, the theme has inbuilt support for bbPress to help your users discuss your products. The SEO optimized theme is also powered by Theme barracks and provides a large number of versatile customization options as well. Games Zone is a tightly packed gaming theme with loads of features to help you create awesome websites with the least amount of hassle. The theme features a retina ready design with well defined, visually pleasing elements and unlimited colour options. Games zone also provides you with a dynamic slider and a static slider with Video support as well. Games Zone’s Mega menu feature is also not something to scoff at. You can create various responsive drop-down menus and customize them all you want. The theme is news/magazine sites as well as blog friendly with its wide range of typography options, google fonts integration, various page layouts and post formats. For your convenience, the theme also includes an amazing contact form module to create highly interactive contact forms for your visitors. Easily customizable theme options and unlimited colours. Multiple slider option with Video integration. Built-in Calendar, Page layouts, Google fonts integration and powerful search options. MegaMenu for creating amazing Drop down and hover menus. ← 6 Best WordPress Popup Plugins to Gain More Subscribers 2019!